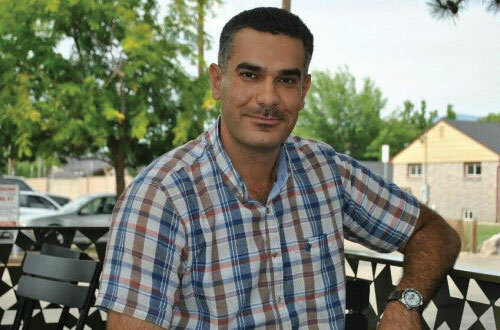 Coming to Boise with his wife and three children in March 2015, Mohammed Al Charakh left behind a “beautiful life” and successful career as a laboratory owner and veterinarian in Baghdad. Because his laboratory worked with several foreign companies, Mohammed explains that the security risks and threats to himself and his family became too great for them to remain in Iraq. In 2010 he applied for refugee status with the International Organization for Migration. The process, including multiple interviews, background checks and medical exams, took five years. Finally, with the assistance of the International Rescue Committee (IRC), Mohammad left Iraq with his wife and three children and moved to Boise. After settling in Boise, the IRC helped Mohammed find a medical interpretation certification program and his first job in the U.S. as an interpreter. He also started volunteering at the Idaho Humane Society, hoping to reclaim his career as a veterinarian. However, the certification process is long and expensive for someone whose education and experience was obtained outside the U.S.
To help Mohammed in his quest to reclaim his career and put his education and skills to work in the U.S., the local IRC office referred him to Global Talent Idaho (GTI), which was still a relatively new program at that time. Working with GTI, Mohammed received training in writing a U.S.-style resume and cover letter, interview skills, and completing online job applications. GTI also helped him submit his first application for a position as a Microbiologist at the Idaho Bureau of Laboratories (IBL). While he didn’t get that job, the IBL recognized his skills and experience and, together with the Idaho Department of Labor and GTI, set up a 6-month internship as a Biorepository Technician. Looking back, Mohammed emphasizes the impact that GTI and the Department of Labor made in assisting him in his career, “the people at the Department of Labor helped me very much [during the internship],” and describes how Gina Finley, GTI’s Program Manager, helped him at every step along the way to revise and update his resume and prepare for his job interviews. Mohammed does miss volunteering at the Idaho Humane Society, but is happy to be busy with his job and his family in Boise. If you would like more information on Mohammed’s story, please see the related story from the Idaho Inquisitor in the link below.